Excessive exposure to sun can be very harmful to the long-term health and appearance of your skin. Various effective treatments are available to srejuvenate damaged and aging skin. Our skin ages due to sun exposure and decreased production of collagen. Ellipse treatments of sun-damaged skin (Skin Rejuvenation or Photo Rejuvenation) help achieve and maintain a younger and fresher look. How does Ellipse treatment work? Ellipse treatments of sun-damaged skin make your skin look smoother by removing age spots, other uneven pigmentation and diffuse redness. Your skin texture may also be improved and many women report that it becomes easier to apply makeup. Facial treatments are most popular, but all parts of the body can be treated. To do this, short, safe bursts of intense pulsed light (called SWT technology by Ellipse, but often referred to as a laser) are directed at the skin. The system filters the light to ensure the wavelengths used are absorbed by hemoglobin in the fine blood vessels and melanin in the age spots. When cells containing a lot of melanin or hemoglobin are treated, the target heats up and is destroyed within a few thousandths of one second. No anesthetics are required, and many patients describe the treatment as practically pain-free, like a flick from a rubber band followed by a sensation similar to the feeling of gentle warmth after a day on the beach. The light used is completely safe, visible light. 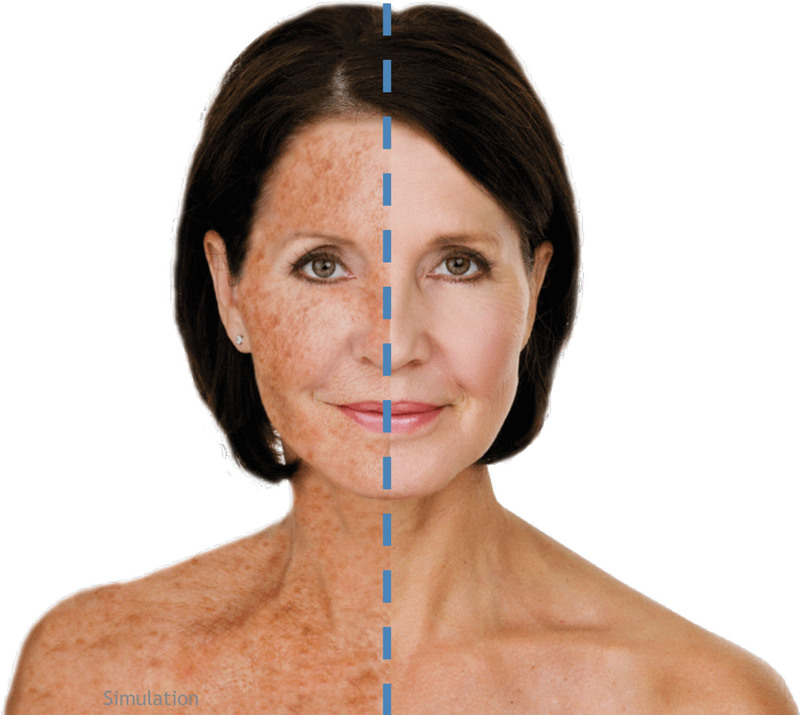 It is, however, important to avoid tanning (sun or self tanning products) before and during the treatment period. Otherwise your tanned skin will absorb more light, which makes treatment less effective and less comfortable. Generally, no special care is necessary after treatment, but people with sensitive skin may benefit from applying a cold compress (a cold damp cloth) to the face immediately after treatment or from using an ointment prescribed by your provider. After treatment, you should avoid sun exposure for 30 days, even if there is no sign of inflammation in the treated area. Use sun protection (minimum SPF 30) if sun exposure cannot be avoided. You may notice that the skin looks a little “dirty” for a few days following treatment. After that you will find that your skin looks smoother and fresher. You might choose to have 1-2 annual maintenance treatments in order to keep your youthful appearance. Clinical trials documenting Ellipse’s safety and effectiveness were carried out by leading doctors prior to the launch of the treatment, and these were published in respected, referenced medical journals. For additional information, please consult your healthcare provider today. Ask your provider if Ellipse is right for you. Ellipse is a producer of light-based solutions for medical and cosmetic conditions. Ellipse has gained the acclaim of doctors and providers worldwide for the quality of products and services. © Ellipse All rights reserved. Package up your face for Christmas! Dr. Bradley Kurgis D.O. M.P.H.